CLIL life in Rainbow English: What is CLIL? 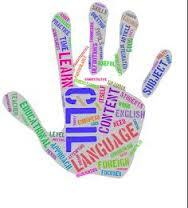 CLIL stands for Content and Language Integrated Learning. It refers to teaching subjects such as science, history and geography to students through a foreign language. This can be by the English teacher using cross-curricular content or the subject teacher using English as the language of instruction. Both methods result in the simultaneous learning of content and English. The term CLIL was coined by David Marsh, University of Jyväskylä, Finland (1994): "CLIL refers to situations where subjects, or parts of subjects, are taught through a foreign language with dual-focused aims, namely the learning of content and the simultaneous learning of a foreign language." Well, for a student the answer would be that CLIL makes a lesson in English more interesting as they would be given a chance to learn about something familiar, connected with their hobbies or school curriculum. That would also mean that such a lesson is full of communication, laughter and creativity accompanied by a variety of tasks. Such a lesson means you would like it to last (almost) forever!